Welcome to the 1st edition of "Cipher Sessions," a new feature here. For our 1st edition I sat down with DJ Ian Head & Verbal Math aka Dollabin to discus their genesis, their music and their podcast, "Fresher Than Your Father." In the digital age that we live there is a glut of music that is available through forums, blogs and social media sites. The ability to drop albums, singles and videos are not as financially burdening as they once were for many independent artists. Technology has also proven to be a double edged sword. On one hand, great artists are able to get their music out to their audience without needing the budget of a record label, but on the other hand... it's just as easy for bad artists to do the same. 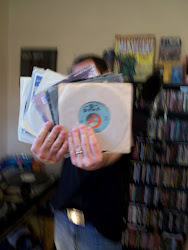 But, as Ian says, "There was a lot crappy music that the industry put out back in the day." Regardless of your opinion on technology, music and how we consume it, one of the dopest hip hop groups I've happened to come across in the last few years is Dollabin. A DJ/emcee duo made up of Verbal Math and DJ Ian Head that combine their love of record collecting and hip hop into some dope boom bap. 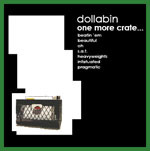 In 2006 they released the "One More Crate" EP, an 11 track introduction to the group featuring solid rhymes & production on tracks like "S.A.T." "Beautiful, " "Pragmatic," & "Heavyweights." When artists were releasing "mixtapes" with 35 songs, Ian and Verb followed the blueprint of Nas' "Illmatic" and kept it short and simple with rewindable/repeatable quality cuts instead of overkill. Hit the hyperlink to DL the digi 12"
Roughly a year later we were given a short taste of what the two were working on when they dropped the "Cold Chillin" digi maxi single. 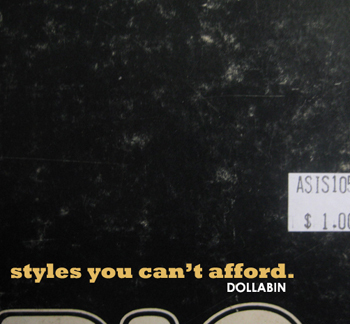 The single only wet our appetite while we were waiting for their full length "Styles You Can't Afford." 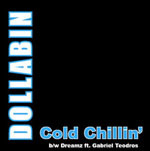 "Cold Chillin" was a quick shot crate diggin' anthem leaving suckers black and blue like the digi 12"s cover. On the b-side we were treated with an upcoming track from their full length, "Dreams" feat. Gabriel Teodros, along with an interlude and "Rusty Shovels pt 2" featuring Omega Jackson. It would have to do until their LP would be released. Finally after long last "Styles You Can't Afford" was released. The album was a much more focused/polished project than their debut, but maintained the same vibe that made their earlier work so dope. Tracks like "Get There," "The Drummer," & "City to City" displayed how Ian & Verb progressed with their writing, beatmaking and mixing. With only two releases the duo has built a catalog that can't be touched by a lot of artists. (period) Do yourself a favor and check these releases along with the other offerings available at Everydaybeats.net. Click here to listen to the debut of "Cipher Sessions."